Why Does Your Microwave Oven Mess With The Wi-Fi Connection? Wireless devices often lose Internet connectivity whenever the microwave oven is running. Here's why it happens and what you can do to fix it. The problem is that both microwave ovens and Wi-Fi operate on the same frequency, 2.4 GHz. In theory, a properly shielded microwave shouldn't leak any radiation, but the reality is that they leak quite a bit, resulting in electromagnetic, or radio-frequency (RF), interference. And yes, Wi-Fi is a radio signal, but it's broadcasting on a much higher frequency than most broadcast radios operate on. This interference at 2.4 GHz can be caused by common 802.11b and 802.11g wireless devices, like routers, along with Bluetooth devices, baby monitors, cordless telephones, video senders, and microwave ovens. Other sources of interference can include toaster ovens, electric blankets, ultrasonic pest control devices, electric bug zappers, heating pads, and touch controlled lamps. To get a sense of this interference, Peter Grace at ServerFault put together these revealing visualizations using a frequency analyzer. The images above shows what the wireless signal looks like in Grace's suburban home. The diagonal lines represent the Wi-Fi broadcast. There's not a lot of interference, and you can see his Cisco Aironet 1240 AP humming along as visualized by the wavy lines in the waterfall spectrogram. Whoa, nelly — that's a hot mess all over the RF Spectrum. This image captures 30 seconds worth of data as the microwave warmed a mug of water. As Grace notes, "You can see through the swamp of RF that the access point does its best to compensate for the signal interference, but that's a pretty strong blast of RFI." To fix the problem, you should upgrade to Wi-Fi equipment that operates in the 5 GHz band, like the latest 802.11n routers (this is the other major band that Wi-Fi networks can operate in). Auto channel may also work, but that's meant to deal with multiple Wi-Fi signals in a small place. By changing channels you can either heighten or lessen the jamming effect produced by your particular microwave. But should you be worried about your microwave oven? Not really, as it should be shielded and not leaking any harmful amounts of radiation; 2.4 GHz is far from ionizing radiation, which is at least 2,400,000 GHz (the type that can harm human tissue and/or cause cancer). 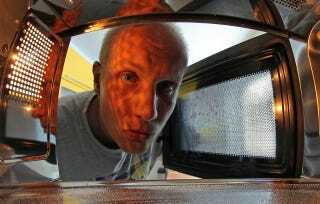 Do microwave ovens kill nutrients in food?